Sensitised skin is one of those pesky problems that most women will face at some point in their life (pun intended!). The common ailment is caused by a damaged barrier function that leads to irritated nerve endings. You won’t need anyone to tell you if you have sensitised skin, you’ll feel it. Sensitised skin is NOT the result of diagnosed skin conditions such as eczema, rosacea or an allergic reaction. Those painful reactions are sensitive skin. We receive daily messages from our customers and followers who want to know how to cure sensitised and sensitive skin. We recommend the following tips to treat sensitised skin before going on to protect and nourish cells to avoid the problem in future. It’s important to note that if sensitive skin is caused by an underlying skin condition, treatment may only relieve symptoms rather than cure them. Regardless of your level of cleanliness, your hands still contain millions of bacteria which can clog pores and irritate already sensitised skin. Always wash your hands and make sure they’re thoroughly dry before applying products and get out of the habit of touching your face unless you absolutely need to. Lack of hydration can irritate damaged skin cells further. Drinking water promotes the skin’s natural hydration processes to strengthen cells and improve function. Drink a minimum of two to three litres of water a day to give your skin cells a natural helping hand. It’s no secret that many moisturisers and products aimed at curing sensitive or sensitised skin are ironically part of the problem. Emulsifiers used to create the thick consistency of moisturisers and lotions can block pores and cause irritation which makes sensitivity worse. Sensitised skin will almost certainly react to harsh ingredients such as synthetic acids, fillers and many preservatives by inflaming already delicate skin cells. Prolonged use of such products can even directly cause sensitivity in healthy skin cells. The only benefit of using a product that contains fragrance is that it will smell nice. Many fragrances – even the natural ones – are known skin irritants that can cause and worsen sensitivity. If you’re not sure how you’ll manage without a perfumey-smelling product, just remember that not using fragrance won’t cause damage to cells leading to sensitivity and sensitised skin, using fragrance will. If a product tells you that it will lock in hydration, it will also lock in bacteria and foreign objects that increase pain and discomfort. Use natural serums and never apply petroleum or thickening products directly to your face. 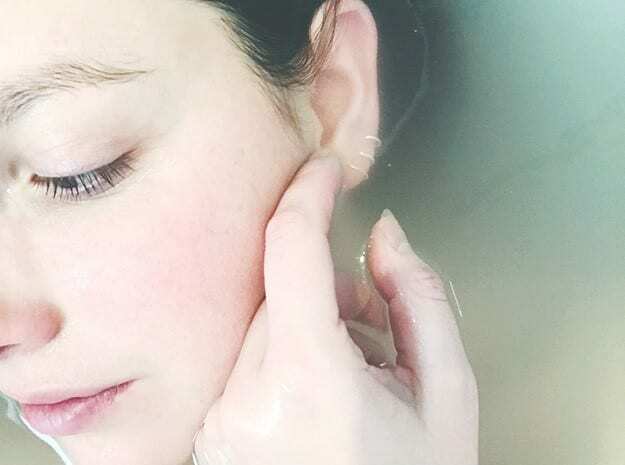 We know it feels like there’s nothing worse than using a harsh scrub on an already painful face but don’t give in to the temptation to skip exfoliation. Exfoliation keeps pores free from bacteria and dead skin cells that can further damage the delicate dermal layer leading to dry, sore patches. Always exfoliate but be mindful which products you use and always opt for a gentle enzyme exfoliator rather than an abrasive scrub to avoid further irritation. When you start to treat sensitised or sensitive skin, apply Bf serum daily until you’ve used one full bottle. Bf serum is made from pure extract of finger lime and is a natural source of tryptophan – a powerful nutrient that will reverse damage and repair the barrier function of the skin. Bf serum is also a natural source of vitamin C which reduces inflammation to ease pain and discomfort. Next, protect and nurture your cells to avoid the problem returning in future. Regularly apply Bd serum potent in anthocyanin to help hydrate, nourish and protect cells deep within the dermal layer. Bd serum contains tartaric acid to help build up a natural barrier to protect the skin from external factors that cause sensitised skin. It also works as an enzyme exfoliator to clear blocked pores without the assistance of synthetic chemicals that can make pain and discomfort worse. Sensitised and sensitive skin can be both painful and uncomfortable, if you’ve followed our tips yet you’re still experiencing sensitised skin, send a DM to @biologiserum for further personalised advice.